BW = poly2mask(xi,yi,m,n) computes a binary region of interest (ROI) mask, BW, of size m-by-n, from an ROI polygon with vertices at coordinates xi and yi. poly2mask closes the polygon automatically, if the polygon is not already closed. The poly2mask function sets pixels that are inside the polygon to 1 and sets pixels outside the polygon to 0. 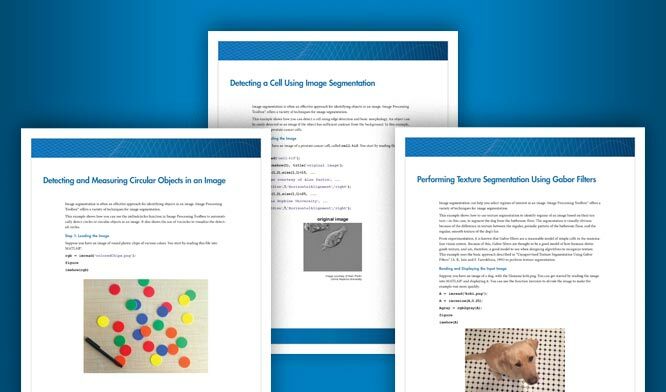 For more information about classifying pixels that are partially enclosed by the ROI, see Algorithm. Specify the x- and y-coordinates of the polygon. Create the mask specifying the size of the image. Display the mask, drawing a line around the polygon. Define two sets of random points for the x- and y-coordinates. Display the mask and draw a line around the polygon. x- or y-coordinate of polygon vertices, specified as a numeric vector. The length of xi and yi must match. Number of rows in the mask, specified as a positive integer. Number of columns in the mask, specified as a positive integer. To specify a polygon that includes a given rectangular set of pixels, make the edges of the polygon lie along the outside edges of the bounding pixels, instead of the center of the pixels. When creating a region of interest (ROI) mask, poly2mask must determine which pixels are included in the region. This determination can be difficult when pixels on the edge of a region are only partially covered by the border line. The following figure illustrates a triangular region of interest, examining in close-up one of the vertices of the ROI. The figure shows how pixels can be partially covered by the border of a region-of-interest. Divide each pixel into a 5-by-5 subpixel grid. The figure shows the pixel that contains the vertex of the ROI shown previously with this 5-by-5 subpixel grid. Adjust the position of the vertices. poly2mask moves each vertex of the polygon to the nearest intersection of the subpixel grid. Note how poly2mask rounds x and y coordinates to the nearest subpixel grid corner. This creates a second, modified polygon. 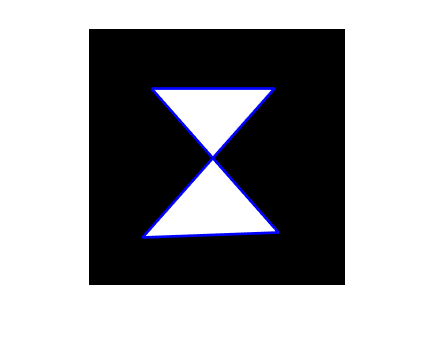 The figure shows the modified vertex with a red "X". Draw a path between adjusted vertices. poly2mask forms a path from each adjusted vertex to the next, following the edges of the subpixel grid. 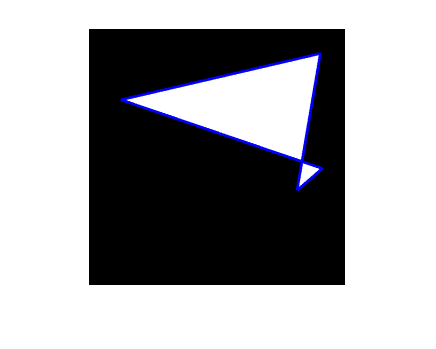 The figure shows a portion of this modified polygon by the thick dark lines. Determine which border pixels are inside the polygon. poly2mask uses the following rule to determine which border pixels are inside the polygon: if the pixel's central subpixel is inside the boundaries defined by the path between adjusted vertices, then the pixel is inside the region. In the following figure, the central subpixels of pixels on the ROI border are shaded a dark gray color. Pixels inside the polygon are shaded a lighter gray. Note that the pixel containing the vertex is not part of the ROI because its center pixel is not inside the modified polygon.